Besides the two books on shipwrecks I have written, I have published a number of articles on shipwrecks over the years. I intend to archive some of my favorite pieces on this site as well as new and unpublished material. Although some of this material is ten years old or more, I think that it still makes interesting reading and hope that you enjoy it. The EM Clark has to be considered one of the best and most dramatic dives on the US East Coast. Located off the coast of Cape Hatteras, North Carolina, it is bathed in the warm clear waters of the Gulf Stream, making it both a treat to dive as well as a challenge. This article was originally published in the August 1992 issue of Discover Diving. The Norness was the first ship sunk off the US East Coast during World War II, and thus holds a unique place in history. It is also a wreck that had never been dived before the introduction of mixed gas diving into the wreck diving community. I had always longed to dive the wreck, and that dream was turned into reality thanks to the efforts of John Chatterton and Dan Crowell, who ran the first ever expedition to the wreck site in the summer of 1993. This article was originally published in the December 1994 issue of Sport Diver magazine. The revenue cutter Mohawk was an obscure victim of collision outside New York harbor during the First World War. Later she would bear silent witness to 63 years of ocean dumping and the poisoning of a specially designated area of ocean bottom outside the harbor. This article was originally published in the October 1993 issue of New York Outdoors, and later in the October 1995 issue of Sport Diver magazine. The steam pipes decorating the ends of an old ship's boiler provide the perfect home for an amazing variety of marine creatures. Next time your diving your favorite shipwreck, check out the apartment complex you may have missed. This article was originally published in the August 1995 issue of Sport Diver magazine. A wreck worthy of the warm, clear waters of Truk lagoon lies in the silty depths of New York's "Mudhole", providing local divers the rare treat of exploring an upright and intact shipwreck. 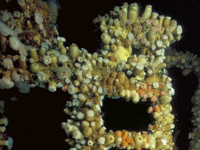 This article was originally published in the December 1994 issue of Discover Diving magazine. Hey wreck diver: ever take a closer look at all those sea anemones covering your favorite shipwrecks? Bet there's some things you never noticed! This article was originally published in the June 1994 issue of Discover Diving magazine.